One BIG Sleep Out is back and it's bigger and better than ever! This year, we’re challenging you, your friends and your workplace to slumber at Stormont. Join our Q Radio presenters Stephen & Cate on November 1st and swap your bed for a sleeping bag to help raise the funds and awareness needed to allow Simon Community to continue delivering specialist support to the thousands of people experiencing homelessness who pass through our doors each year. Simon Community NI is Northern Ireland’s leading homelessness charity. Each year we support around 3,000 people from all walks of life who find themselves without a home. 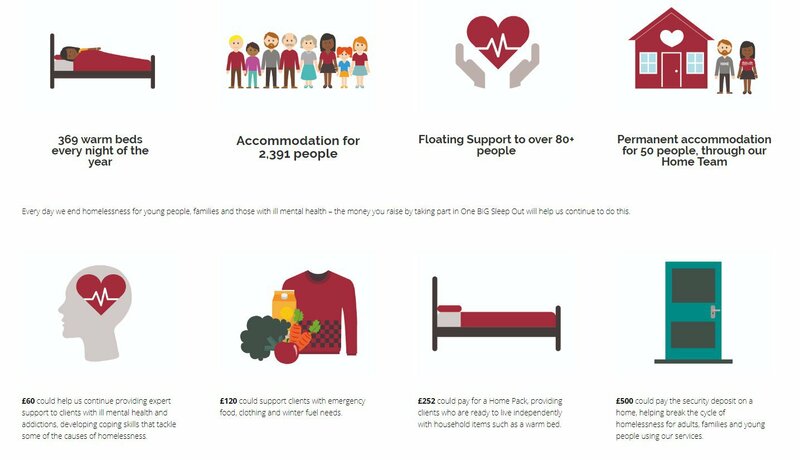 Although the One BIG Sleep Out event will not be able to replicate the real emotional and physical difficulties of truly experiencing homelessness, it will show you some of the realities and it will challenge you. On the night you will enjoy a delicious BBQ and entertainment until bedtime. Hot drinks will be available to help keep you warm and there are toilet facilities nearby the One BIG Sleep Out site. There will be music and Q Radio hosts Stephen & Cate will there to entertain the group. Please make sure you arrive between 7- 7.30pm to allow time to register, find your sleeping spot and avail of the hot food. Take advantage of the early bird offer, tickets are £20 per person - sign up today here. If you sign up today, you will receive your free Fundraising Pack filled with hints, tips and more information! The event is open to anyone over the age of 18. Dogs are not permitted due to health and safety reasons. More details on the event can be found online - click here.